On Tuesday we were informed that tomorrow was children's day and it is expected that Anna dress up in a 'fancy dress'... IE costume... not having time to make something we bought this pretty little princess dress. Wednesday Anna hated putting it on in the morning. Looked so awkward walking to school with all neighbors holding back the laughter... and we felt bad as many other students had not dressed up. After school she came home her face all dirty, she did not eat her lunch, and just ran all around the apartment for hours. 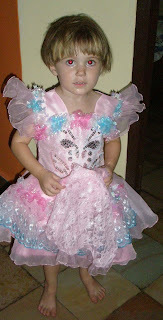 It was late in the evening before we could get her out of the dress, she was happy to wear it all day. And she was happy to eat all that chocolate at school. Only about every other day... we have not givin in... yet. But she looks so adorable in it. And I know that chocolate goes with every outfit, no matter the age!